I promised you a pattern yesterday for the little coffin box I posted on Sunday, and I haven't been able to get that quite finished to my satisfaction yet, so I wanted to share another card with you in the meantime. It just snowed here in Colorado Springs for the first time yesterday...which is kind of deja vu because this year we had snow on Pike's Peak as late as July. Anyway, I really like these colors together--Soft Suede and Brocade Blue. 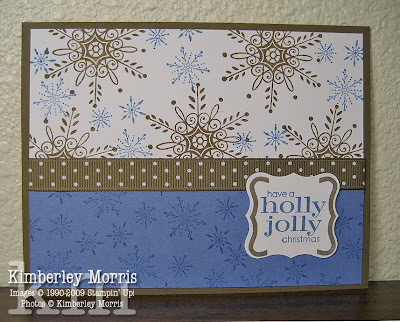 The main stamp set is Serene Snowflakes, from the Holiday Mini Catalog, which is such a beautiful set, you just have to have it! The little tag is from the Christmas Punch Hostess Stamp Set, which you can get for FREE with a $300 Workshop. If you just bump your Workshop up to $300, you could get Serene Snowflakes for $10, plus the Christmas Punch Hostess Stamp Set for free, and then buy most of the rest of the supplies to make the snowflake card pictured above, as your holiday card...for FREE!!! This card is really simple to make, so it's a great card to make as a family project with kids. There is also a $42 O Christmas Tree Pop-up Sizzix Die in the Holiday Mini Catalog that you can get for a STEAL with this promotion. I'll post a pop-up card soon that I made with that die, and if the picture of the card does it any justice, you will definitely NEED that die for your holiday cards! If you are in the Colorado Springs area, give me a call or text me at 719-205-5957, or drop me an email, to book your Workshop now...book early to get your date of choice. We can have a workshop in your home, or in mine, or at your office during lunch, or down at the corner café on a lazy Sunday afternoon. We have a lot of options, and I'd love to stamp with you and your friends. Or, if you'd rather just pass the catalog around, and gather orders, that counts as a workshop, too. So, just contact me and let me know how I can help you earn your Sweet Rewards. Welcome to my stop on the September 2009 Control Freaks Blog Tour! You should have just come from the blog of Shona Watson. 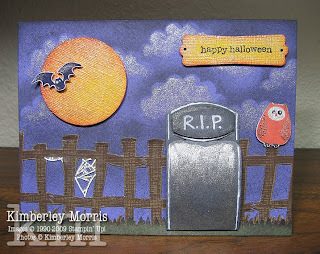 My first card was really hard to get a good picture of--it's kind of a dark card, and I used shimmer paint for moonlight. The only problem with that is, the shimmer paint kept reflecting the light off my lamp! I know I'm biased, but with that shimmer paint, it's really gorgeous in person. There is a little surprise hiding in the grave marker...the grave marker is actually trimmed down from the Two Tags Bigz Die, with a Small Oval Punch layered at the top for the R.I.P. engraving. 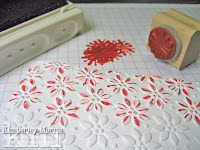 This next project uses the Fancy Favor Bigz XL Die, and the Sweet Centers stamp set, with the Sweet Treat Cups. I wanted to toss in this beautiful little stick candy favor, but I have to tell you that even though I stamped it, it was not my design idea. It's just so pretty, I had to share. And this last little fella is a special treat box...a coffin made using the Box #2 XL Die, and a pattern I created for the top. Come back on Monday and I'll post the pattern and instructions for you--it's super simple. UPDATE: YOU CAN FIND THE COFFIN BOX PATTERN HERE. Click the button to the left to go to the next stop on the Tour de Freaks Blog Tour...the blog of JAN TINK! 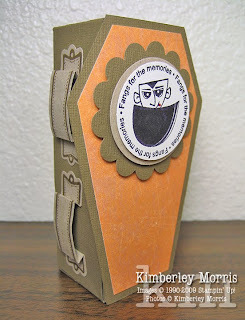 Jan created a darling coffin treat box (on an older blog post, not on this tour) which inspired the one I made above. At the team meeting where everyone was making this card, I was wandering around taking pictures, so I didn't get my card done. I finally pulled out the pieces to it this weekend and finished it. The white texture on white card stock is very elegant, but I just felt like I wanted to add something to it. The main ornament on the card is from a stamp set called Delightful Decorations. There is one little stamp in that set that I thought would make a cool background, but the card already had the background texture embossed into it. Then, I noticed that it just happened to be the same size as the flowers on the Petals-A-Plenty Embossing Folder that had already been used on the background layer...and I thought, Why not use both backgrounds? You can probably already see where I'm going with this, but let me walk you through exactly what I did. 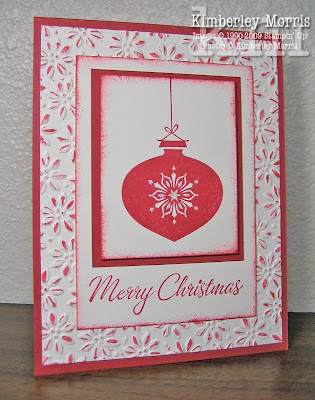 First, I inked up the stamp (in Ruby Red for this card), and then I stamped the ink off, one time, onto scratch paper. 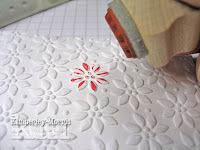 Then, without inking the stamp up again, I stamped it over one of the flowers on the card stock which had been run through the Big Shot in the Petals-A-Plenty Embossing Folder. You don't have to be precise. My only caution is that you shouldn't SMASH the stamp onto the embossed flower, or you'll lose some of the charm and subtlety you get when only part of the stamped image shows up. 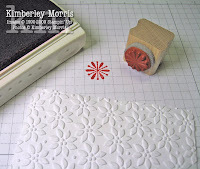 You can stamp over all of the flowers, as I did on my card, or you can stamp in a pattern, like a checkerboard, or every other line of flowers. You can even alternate colors. It's just that easy! It sort of gives the card a stucco look, in my opinion. This would probably look very elegant when stamped in neutral colors like Sahara Sand or Creamy Caramel. And, you know you'll just have to try stamping over the top of these flowers with that gorgeous Champagne Mist Shimmer Paint! Oooh la la!!! 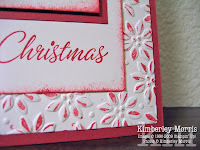 TIP: Save yourself time if you are adhering layers over the top, and don't bother stamping the pattern where your card stock layer is going to cover it. Shop in my ONLINE STORE for these Stampin' Supplies: Delightful Decorations stamp set, Four the Holidays stamp set (greeting), Tree Trimmings stamp set (ornament hanger), Whisper White Card Stock, Ruby Red card stock and ink, Stampin' Sponge, Petals-A-Plenty Embossing Folder, Two-Way Glue Pen & Dazzling Diamonds Glitter (to accent the center of the ornament). NEW - 2009 Holiday Mini Catalog! Demonstrators have had the preview for this fabulous mini catalog, and the chance to preorder at a discount, for a few weeks now...and we've just been dying to show you what we all feel is undeniably the BEST MINI CATALOG EVER! 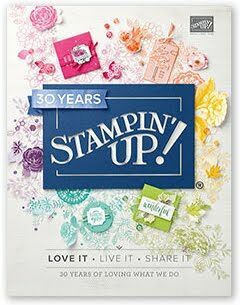 Click HERE to view, or right click to download, the Stampin' Up! 2009 Holiday Mini Catalog. Yes, the Holiday Mini Catalog features two exclusive Hostess Sets on pages 4 and 5! Pick Patterned Pines as a FREE Level 1 benefit, with at least $150 in Workshop sales. With at least $300 in Workshop sales, the Snow Buddies set can be yours as a Level 2 benefit, absolutely FREE! Turning to pages 6 and 7, you'll see an awesome new stamp set called Sweet Centers. It is designed for use with the new Sweet Treat Cups, which can hold candy, confetti, or whatever little sweet treat you'd like to share! When you use the stamp set with the cups, and pop out a 1-3/4" Circle Punch, you can create a hot air balloon, an ornament, a heart with a center, a treat-centered Halloween greeting, and even a flower with a treat center (by stamping petals and leaves around the treat cup). You can safely mail these specialty cards using the Sweet Treat Padded Envelopes. Featured at the top of page 7, these magnetic dies are used with the Movers & Shapers Curly Label Die. Four shapes are included in this set: an Elegant Label, a Dove, an Ornament, and a 1-3/4" Circle. The Circle is the perfect size to use with the Sweet Treat Cups, and the Ornament is just slightly larger than the new Ornament Punch (featured on p. 25) so it is perfect for layering. The Grateful Greetings stamp set, on page 8, features 12 different sayings you can use throughout the holidays. There are greetings for Halloween, Thanksgiving, Christmas, and Valentine's Day. If you aren't at all into a ghosty-witchy Halloween, you can still send festive greetings with the Pumpkin Patch stamp set, on page 9. This set features a circle and two ovals, which you can use as pumpkins, or stamp faces on them to create jack-o-lanterns, or use them as decorative ornaments in seasonal colors, or use the ovals and grass to make Easter eggs, or even use the shapes as BALLOONS! This may be one of the most versatile sets in the Holiday Mini Catalog for year-round use. Page 11 features Night & Day Specialty Designer Series Paper, in black & white patterns. There are 10 double-sided patterned paper sheets (2 ea. of 5 patterns), and 2 black polka-dot printed window sheets. 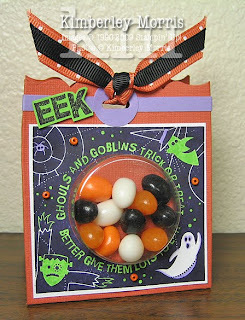 These are great for so much more than just Halloween--for example, they are excellent for masculine cards or scrapbook pages, so stock up now! The Autumn Splendor stamp set featured on pages 12-13 features 2 leaves, one leafy sprig, and a cute little double acorn stamp. Use this stamp set with the coordinating Autumn Meadows Designer Series Paper, and the Table Setting Bigz™ XL die to set the scene for a beautiful gathering. The Table Setting Bigz™ XL die features a spiral that, when wound, can be made into a pine cone or rose. Also make leaves (or candle flames! ), place cards, napkin rings, and tags using the rest of the images on the die. With the Calendar Kit and coordinating Note to Self stamp set on page 14, create a personalized 2010 calendar for yourself, and a few for friends and family! The Calendar Kit includes a raw chipboard easel for display, which can be colored with Craft Ink, or covered with card stock, or patterned paper. Box your calendar up in a Magnetic Gift Box (see page 33) and tie with coordinating Chocolate Chip 1-1/4" Striped Grosgrain Ribbon from page 183 of the 2009 Idea Book & Catalog. Check out all the coordinating product on pages 20-21...don't you just have to have it ALL? The Berry Christmas stamp set coordinates with the Merry Details Sizzlit die, and the Christmas Cocoa Specialty Designer Series Paper. 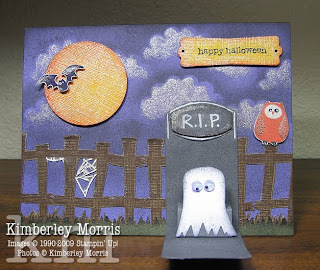 The paper features metallic and flocked highlights! You'll get 12 sheets total: 2 each of 2 single-sided flocked papers, and 2 each of 4 couble-sided designs. Throw in the Petals-A-Plenty Embossing Folder to add the perfect depth to any project you create with this collection, and use the Merry Embosslit to run out quick and easy gift tags. Speaking of coordinating products, you'll have a ball with the Delightful Decorations stamp set and Ornament Punch on pages 24-25. If you don't want to stamp, pick up some Merry & Bright Rub-Ons to use instead. The Rub-Ons come in a package of 2 sheets, one with Silver images and one with Whisper White images. Either the Sparkle & Shine Jumbo Wheel, or the Sassy Sparkles Jumbo Wheel would make a great background for a coordinating seasonal card or scrapbook page. You'll find some fun sparklies on page 27, with three Shimmer Paints, as well as Gold Elastic Cord, and Silver Elastic Cord. The Champagne Mist and Frost White paints are translucent, while the Platinum paint is opaque. The acid-free pigment based paints work great on paper, wood, and even fabric (if you heat set). Make sure you grab some Sponge Daubers from page 192 of the 2009 Idea Book & Catalog to use with the paints. Use the O Christmas Tree Bigz™ XL die, and Tree Decorations Sizzlit die to make sensational pop-up cards for the holidays! The trees also make darling stand-alone place settings or favors. You can decorate the tree however you like, and use it year round, as a Halloween, Easter, or Valentine's tree--just vary your color scheme and decorations. Regardless of how you use it, it's always gonna get a WOW! Going simple and inexpensive can also be stylish and trendy with any of the choices on pages 30-31 of the Holiday Mini Catalog, all of which are under $10 each! 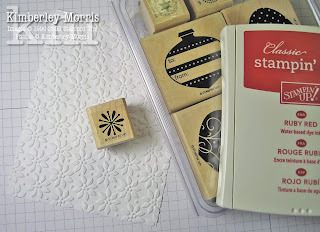 My favorite idea is to stamp the Bearing Gifts stamp on white card stock in black ink, and let the kids color the tags to keep on hand to put on gifts. This can keep them busy for HOURS, all for only $8.95...but really, moms know it's priceless! The stamp also makes a cute place card for holiday events, if you omit the "to" and "from", and stamp the remainder of the image at the corner of the place card. Do you participate in a yearly Toys for Tots drive? This image would be so perfect stamped on the corner of a Thank You card (again, omitting the "to" and "from") to be sent to volunteers and sponsors after the event. The Simply Adorned Charms and Simply Adorned Chains are temporarily unavailable in order to resolve quality issues, so I'll save you the time (and the pining) and I'll feature them once they are available. I have to tell you, though, these are not only great on a necklace, they make awesome ornaments, or portrait holders for a 3D Family Tree Display. Both the charms, and the chains, are packaged in their own gift boxes--so they will make perfect last-minute gifts you can personalize yourself, especially with the images from the Charming stamp set on page 32. Pages 34-37 feature our new Build-A-Bear Workshop product line. There are stamp sets, patterned papers, and dies to cut out bears, bear clothing and accessories, and even a little baby bear and pawprint! If you have little ones at home, or you are looking to spend some fun quality time with grandkids, this collection would make an awesome family Christmas present. Purchase before Christmas to make holiday cards together, then, use the products to make cards, scrapbook pages, and other crafts year-round. Get all of the available products in my ONLINE STORE, delivered direct to your door! Order now, and take care of all your holiday and gift-giving needs before the rush. Click Customer Login near the top right to log in or create a customer account.